While all avathars are incarnations of Lord Vishnu it is Aadisesha the five hooded of snake on which Mahavishnu reclines in his 'yoganidhra' that incarnates as Balarama. Balarama was born to Vasudeva and his first wife Rohini. Thus he becomes the elder brother of Lord Krishna. There is not much significance in this avathar. 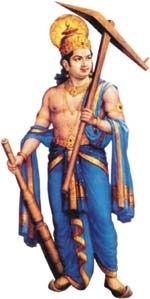 From the evolutionary angle this avathar marks the period when human started a settled way of life taking to agriculture- Balarama is pictured as carrying a plough on his shoulders. Being a contemporary of Krishna the spot light is more on Krishna than on Balarama.